The University provides a suite of academic technologies which are automatically available to you. Where to start depends on your immediate priorities so it it worth making contact with your campus Learning Technologist, but in the meantime have a look around the site using the banner menus, following links in the tag cloud, or just use the search box. 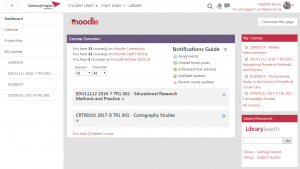 How do I access my Moodle modules? Access to the current Moodle modules you are teaching requires an enrolment, and this is carried out by a contact within your school administration office. They should be consulted in the first instance if you you cannot see a module listed on your Moodle dashboard. 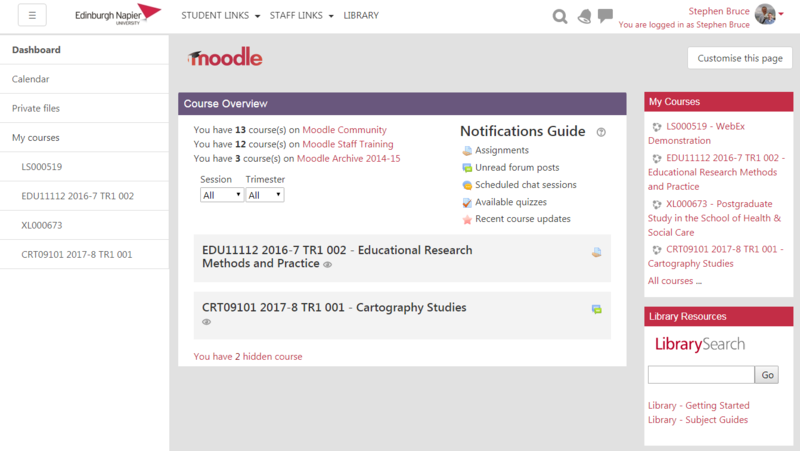 Moodle is accessed from https://moodle.napier.ac.uk and is linked from the Quicklinks tab on the Staff Intranet. This will take you to your Moodle dashboard and where you will find links to the modules you are enrolled upon. The Course Overview block lets you filter the links so that only modules from specific sessions or trimesters are displayed. If you have courses on the Moodle Community, Training or Archive servers then these are accessible via links above the session/trimester filters. The starting point in thinking about any learning and teaching intervention is usually the pedagogic model you want to use as all other considerations flow from that decision. What is it that you are trying to achieve with students? Once that is determined then you can decide the best way to approach delivery of your course and the tools you will need to achieve that. Accessing help with adding Moodle activities and resources is simple whether you need information or if you would like to suggest an improvement for development within the Moodle platform.